EarthSky Tonight—Tonight Nov 10, Can we see stars outside our Milky Way galaxy? The answer is no – unless you count seeing the combined light of many billions of stars. From the northern hemisphere, the only galaxy outside our Milky Way that is easily visible to the eye is the great galaxy in the constellation Andromeda – also known as M31. It is shown in the image at the top of this post. In late November, the Andromeda galaxy is visible from nightfall until about 4 a.m. Tonight, however, the moon will not set until after midnight. The Andromeda galaxy will appear as a hazy patch in the night sky, as wide in diameter as a full moon. This haze represents the light of the Andromeda galaxy’s billions of stars. Nevertheless, we still cannot see individual stars within this galaxy — not with the eye alone. 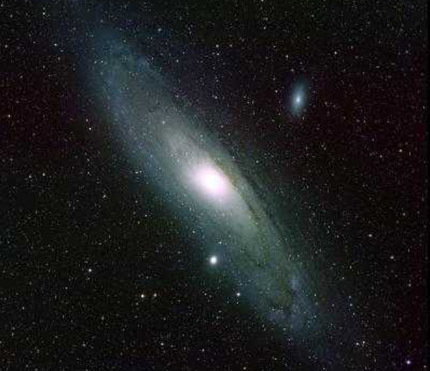 Even with amateur telescopes, the patch of light that we see as the Andromeda galaxy looks, at best, like haze. By the way, the image at right shows a second galaxy – M33, in the constellation Triangulum – that some experienced observers have glimpsed with the unaided eye, under perfect sky conditions. The Andromeda galaxy is 2.2 million light-years away. The Triangulum galaxy is only slightly farther away at 2.4 million light-years. Both the Triangulum galaxy (M33) and the Andromeda galaxy are members of our Local Group of galaxies, which also includes our Milky Way Galaxy and about 30 other smaller galaxies. Like the Andromeda galaxy, M33 one of the most distant objects that can be viewed with the unaided eye.